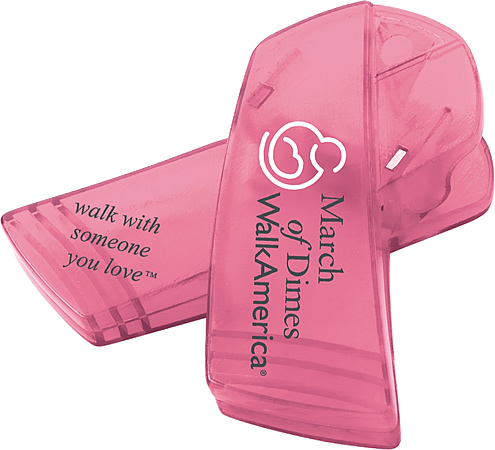 Promote breast cancer awareness, patriotic events or use as a promotional bag clip for any awareness. Features of the awareness shape bag clip are heavy plastic molded construction with a steel spring. The overall size of the clip is 4" w x 3 3/4" h x 1 1/4" d.
Price includes a one color imprint on diagonal top area 2 1/8" w x 9/16" h.
color add setup of $55.00 and a run charge of $.30 ea. Bag clips have a maximum of a three color imprint.